The title says it all. An ISIS group is saying they will attack Notre Dame. They say “wait for the next”. I don’t know if that is claiming credit for this one, or if it means the next fire. 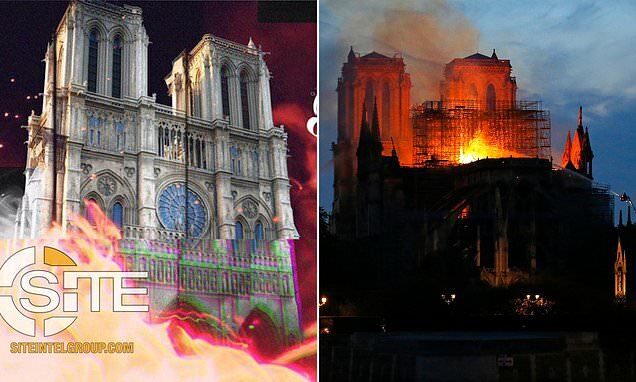 It’s a real shame what happened to the Temple of Jupi-- err, Notre Dame. Here’s hoping there wasn’t too much religious jackassery behind this fire. It’s possible. Somebody said that they heard a loud pop before the fire was detected. Could have been an electrical circuit or a timing device. We may never know. The builder’s quest for height and light is both what made the cathederal so beautiful and made the fire so devastating. Ordinary timber construction with heavy timbers is actually resistant to collapse because the outer layers of wood char protecting the inner and preserving most of the strength. This is unlike steel or iron that can lose most of their strength under similar conditions. But to be tall and let in the light these cathedrals had to be lightweight and embody the old axiom: “a designer knows he has reached perfection not when there is nothing less to add but nothing less to take away.” It took time and hard won experience, actual collapses under ordinary loads, to learn how much to take away was too much. But taking away to lighten the structure inherently cuts into the safety factor of timber construction and rapidly moves you in the direction of stick construction which just becomes so much kindling in any fire. I honesty have no idea why a tinder box such as this was never re-fitted with a modern fire suppression system. Again: when it was built the cathedral was a delicate balancing act between standing up an falling down. That doesn’t mean it was badly built: it was superbly built as witnessed by the fact it stood so long. Reminds me of that one Yoda line: when my age you are look as good you will not. But because it was built so artfully, rather than rigorously through many engineering calculations as modern buildings are, that meant that no one today could be sure how much they could add before they added too much. Truly light weight fire suppression systems, which are all hightech foam based, are quite recent. Just the last few decades for the best stuff. And they have to be designed for the space and structure … so not cheap either. And that’s assuming anyone had even thought of it. It may in retrospect seem a no-brainer to you or I but when something has just stood for a long time the temptation is there to think it just will … if you’re careful enough. The German Zeppelins were managed with the same thought processes and were wildly successful and safe right up until the Hindenburg burned. So it’s not like this attitude never happens. In fairness, it seems common for churches to be destroyed in France. Ask yourself- What has changed in France in the last 4 years that might have caused that? What ever happened, it’s obvious that the NRA and Republicans are at fault. I’m sure Trump’s at fault and all else follows. The French government has ruled out Arson as the cause of the fire. But hasn’t the Trump Administration announced the defeat of ISIS… twice? Yes. They ruled it out within 2 hours of the start of the fire. That’s odd. I have a brother who is a fire chief. He said an arson investigation on a simple residential house takes all day. When did you conclude your investigation? I trust the french authorities your looking for a conspiracy. Governments certainly don’t lie. I’ve never heard of one lying. Where did I say I was looking for a conspiracy? What’s more logical? An accident occurred in an building that has stood for hundred of years, or a mass conspiracy involving the French government? 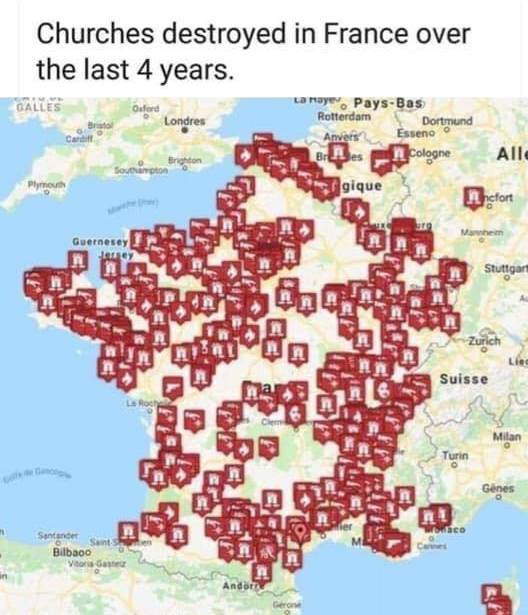 I think that they may have received a large number of unscreened Muslim migrants who do not seem the slightest bit interested in repaying French hospitality? Just a guess though. Probably. But how do you determine that it wasn’t an accident before the cause has been discovered? And how do you make any statement as to the cause while the building is on fire. Highly irregular.